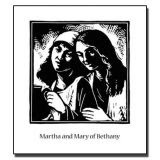 Jesus in Love Blog: Martha and Mary of Bethany: Sisters or lesbian couple? Martha and Mary of Bethany: Sisters or lesbian couple? Mary and Martha of Bethany were two of Jesus’ closest friends. The Bible calls them “sisters” who lived together, but reading the Bible with queer eyes raises another possibility. 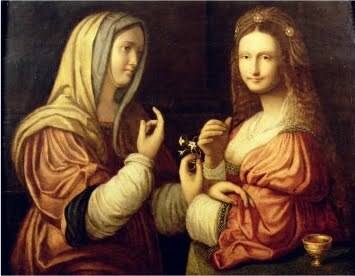 Maybe Mary and Martha were a lesbian couple. Their feast day is today (July 29). Mary and Martha formed a nontraditional family at a time when there was huge pressure for heterosexual marriage. Wilson expands on this theory in her book Outing the Bible: Queer Folks, God, Jesus, and the Christian Scriptures . Mary and Martha are best known for the conflict they had when they hosted Jesus and his disciples. Mary sat at Jesus’ feet to listen, but Martha wanted her to help her serve. Jesus’ famous answer: “Martha, Martha, you are worried and upset about many things, but only one thing is needed. Mary has chosen what is better, and it will not be taken away from her.” (Luke 10:41-42). In another major Bible story, Jesus talks with Mary and Martha in turn before raising their brother Lazarus from the dead. During the conversation, Martha speaks what is considered the first profession of faith in Jesus: “I believe that you are the Christ, the Son of God, who was to come into the world” (John 11:27). Like with most Biblical figures, the truth about Mary and Martha is a mystery. The gospels references are brief and sometimes contradictory. As a result, Mary of Bethany is identified as Mary Magdalene in the Roman Catholic church, while in Protestant and Eastern Orthodox traditions they are considered separate persons. Artists provide some beautiful paintings of the “sisters,” including the one above by Italian Renaissance artist Bernardino Luini (1480 -1532). Magic realist painter Eileen Kennedy has done a new painting of them as contemporary women. Kennedy’s “In the House of Martha and Mary” is on view at the Episcopal Cafe Art Blog. Martha stands angrily with vacuum cleaner in hand as her sister listens to Jesus. One of the things that annoys me the most about the patriarchal attitude towards women in the Church is the "confusion of Mary's". There is no way that even a child reading all four gospels could fail to recognize that Mary Magdalene and Mary of Bethany HAD to be different people. That is one of the things I find so extremely meaningful in your characterizations in "Jesus in Love". You give such delightful and fully-realized portraits of Martha and the two Mary's, genuinely allowing them to speak "truth" which goes way beyond the haziness of poorly-reported detail. Actually as a child I thought Mary Magdalene and Mary of Bethany were the same person -- probably based on movie versions of the Bible that confused and conflated the Marys as you say. When I wrote “Jesus in Love” I really wanted to give an individual voice to each of these two Marys and of course to Mary the mother of Jesus. I’m glad that it spoke so powerfully to you.